On Wednesday the 29th June, Year 9s had a road safety day, as you have had or will hopefully have in the future. We were all separated into groups, given name stickers and a timetable. Our group (group E) started the day with the two representatives from the Devon Air Ambulance (DAAT), who gave us an insight to the invaluable work that everyone involved in the charity does, from the pilots/ first aiders to the people working in the shops, They gave us an inspiring first session, along with even more respect for the charity than we all had prior to the discussion. Period 2 we spoke to the Police. The session mainly covered the over consumption of alcohol and how it affects you mentally and physically, and the consequences of drinking irresponsibly, such as drink driving. We also used a machine to test our reaction times. This demonstrated how your reaction time is affected after the consumption of alcohol. To simulate this affect we were given goggles to allow us to experience almost what it feels like to be under the nfluence; it showed us how to be responsible in the future along with what not to do. The policeman had some strange stories which he shared about how he had been irresponsible: this put us all off I’m sure! For the third session we had the Community Police from Holsworthy. Their session showed us a video on anti-social behaviour and how just a look can change someone’s life along with their family’s lives forever; we were also shown a variety of drugs and how to identify them, so we are aware of anything affecting us in the future. Fourth period we did some basic first aid skills with a lady from St John Ambulance. We went through some basic first aid procedures, along with pairing up and practicing the recovery position. As it was road safety day we also imagined our own car accident and were shown what to do in this case of events. Our last session was delivered by the Fire Brigade. This mainly consisted of videos, some more graphic than others, in an attempt to prove to us that every second counts. Even things like wearing a bike helmet, although seen as being un-cool, could save your life. Finally, the last section of the day consisted of the Fire Brigade demonstrating what would happen in the case of an extreme car collision, which saw Jasmine Greenaway as the casualty. The procedures were long and appeared to be tiresome, but in the end it would all pay off. 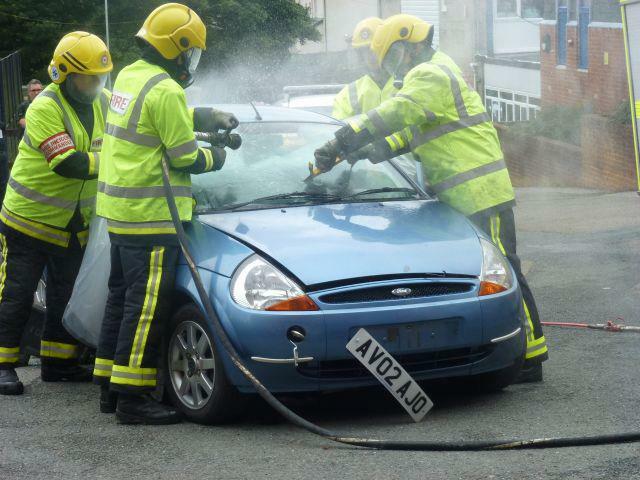 The fire service personnel did what they would do in a real case, such as cutting the glass of the windscreen and removing the roof of the car to free the trapped casualty! The whole day was amazing and the main message I received from the day is that we should never start something that one of these amazing emergency services will have to finish; I didn’t realise how often they have to deal with problems caused by young people due to them being stupid. It shows that hopefully this can at some point in the near future be changed so the services can be used for people in need, not people driving home under the influence, and putting themselves and others in danger. The day was particularly inspirational and has changed our perspectives greatly, thank you for organising it!